Goodridge G-Stop High Performance Brakeline race-bred street brake lines are constructed from the finest quality hose, consisting of a PTFE inner hose covered by braided stainless steel. In addition to providing a more responsive and firm brake pedal by eliminating the â€œspongyâ€� feel that often accompanies stock rubber brake lines, G-Stop High Performance Brakelines are abrasion and corrosion resistant to stay good looking for a long time to come. 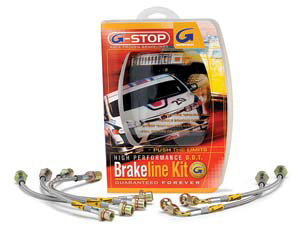 Goodridge G-Stop High Performance Brakeline Kits are direct bolt-on replacements for all of the rubber brake lines in the vehicleâ€™s brake system. (Three to six brake lines are included in each kit depending on the vehicleâ€™s original design). To ensure proper fit and easy installation, hose ends and brake line brackets that match the vehicleâ€™s original equipment style are used for each application.